This is a pretty cool looking vehicle. 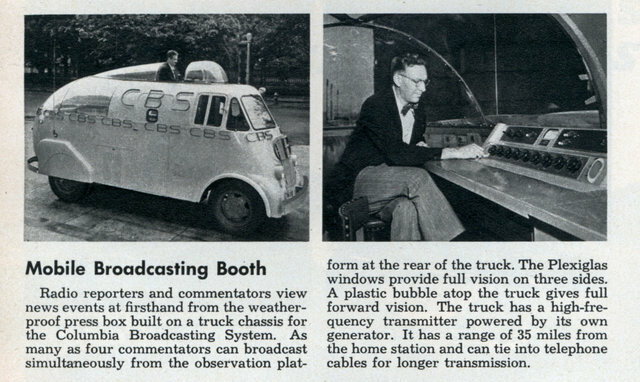 Radio reporters and commentators view news events at firsthand from the weatherproof press box built on a truck chassis for the Columbia Broadcasting System. As many as four commentators can broadcast simultaneously from the observation platform at the rear of the truck. The Plexiglas windows provide full vision on three sides. A plastic bubble atop the truck gives full forward vision. The truck has a high-frequency transmitter powered by its own generator. It has a range of 35 miles from the home station and can tie into telephone cables for longer transmission.